Getting under the boom when tacking was a challenge! 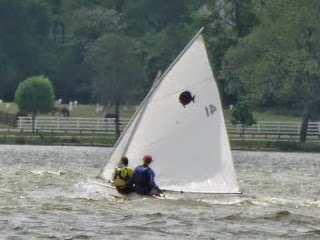 This past weekend Doug and I sailed in a small regatta at the Dallas club which is always a special experience for Doug when he returns to sail in their open regattas. First of all, the Laser fleet that sailed was excellent. 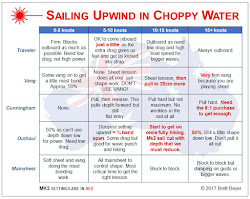 Small fleet, new blood, really good group of sailors and they had to work extra hard to stay on the course because it was a breezy weekend with gusts near 30 mph. 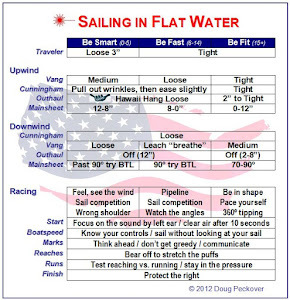 It was so windy that a young 4.7 sailor took second place while a full rig or two had some swimming lessons. After lunch, I abandoned my boat and joined Doug on his boat and Greg Gust schooled us on the art of balance. Two people hiking like heck and Greg goes by us, sitting up, not hiking, and probably even had the main cleated. Doug couldn't believe his eyes. Our tacks were pure entertainment. I watched Doug slide back and press his face to the deck as he switched sides and got to laughing so hard I almost didn't make it across. I had to quit watching after that. We learned that Doug has never chicken gybed in his life and hadn't a clue how as we came to a dead stop at the lower mark. Afterward, Greg was more than willing to share information on the art of getting the boat balanced so that it wasn't so much work. Doug missed his Laser. I loved watching him be challenged and puzzled. I think the Fish has something to teach us and the Fish sailors are wonderful. We'll be sailing it more this year. 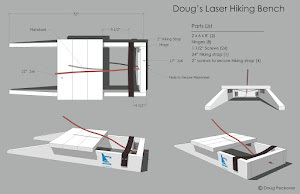 I'm betting it will make Doug a better Laser sailor. Shout out to young Laser sailor, Caleb and his parents. Awesome job! Keep it up.